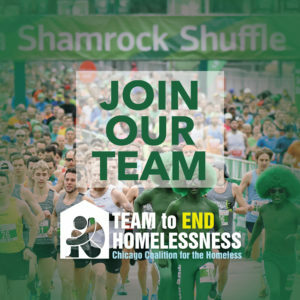 CCH is now recruiting runners who would like to participate in the Bank of America Shamrock Shuffle 8k race on Sunday, March 24 to be part of our Team to End Homelessness. Runners are asked to set a fundraising goal, with a suggested minimum of $1,000, to be raised online in conjunction with their race training. If interested, please contact Claire Sloss at csloss@chicagohomeless.org or complete this interest form. Even if you are not planning to run the 2019 Shamrock Shuffle with our team, if you register for the race, please use our unique registration link. If you register between Monday, January 28 and Monday, February 11, Bank of America will provide a dollar-for-dollar match of donations up to $20,000 when runners choose the “8K Run + Charity Donation” option at the point of registration. For more information, contact Claire Sloss or complete this interest form.